Ananthasayanam is a famous pose of Lord Vishnu or Anantha Padmanabhan as is known in Trivandrum, Kerala. It is replicated in a Gold Necklace Pendant by highly skilled artisans. The Gold Locket is marvellous and has the finest and tiniest detail of Ananthasayanam. 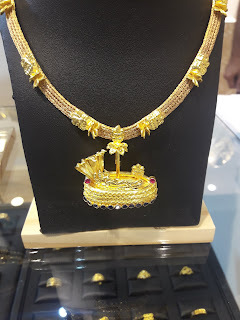 The Pendant is hardly 4 cms in length and the whole necklace weighs around 54 gms Gold. It is for sale and it comes at a bargain price because of less making charge. Call 9895039531 for details.